In its two storey booth, Allison Transmission provided information on its fully automatic transmissions for medium and heavy duty commercial vehicles. One of its newest products is xFE for city and transit buses, which is designed to improve fuel economy by up to 7%. The xFE transmission is designed specifically for the constant shifting and lower average speeds of bus duty cycles, increasing efficiency. The company has recently announced that Italian operator, IAS Touring, has added a new Van Hool TX Altano equipped with an Allison fully automatic transmission. The 14m TX Altano 18 is the first in Italy with a transmission from Allison. Equipped with a 510hp DAF engine, the coach is fitted with an Allison Torqmatic model T 525 with retarder. Nearer to the show, it was also announced that üstra Hannoversche Verkehrsbetriebe AG is growing its fleet with the addition of ten Allison H 50 EP hybrid system equipped Solaris 18H buses, which are to be delivered in 2017. Voith gave visitors a look into the next generation of its DIWA automatic transmission. The manufacturer is studying the integration of a central recuperation unit, an extra gear and the separation of the torque converter and retarder. In order to make the best use of the location between the engine and transmission, the company plans to add a central recovery unit to the DIWA in the future. The compact 48 V electric motor requires almost no additional installation space and is integrated around the vibration damper. As a result, the power train remains compact and does not need any added systems that have to be connected via a belt drive. The central recuperation unit means the DIWA will control and transmit not only the drive torque in future versions, but the partial hybrid system will also provide support for the diesel engine during demanding route sections and supply power to additional components such as the air conditioning system. ‘See – Think – Act’ was the message on ZF’s stand, promoting its commercial vehicle technology. New is an all electric central drive which will bring city buses closer to zero emission driving when it starts to appear in production vehicles during 2018/2019. This technology is designed for driveline configurations similar to those in conventional vehicles, making it easy to integrate within existing concepts. The fact that the central drive can be combined with both single rear drive axles and conventional low floor axles means it can be installed in low entry buses and low floor buses. The popular AVE130 electric portal axle is another solution for low floor buses because it provides weight benefits in the vehicle and accommodates flexible vehicle architectures with open interior designs. ZF has developed the TraXon Hybrid, which features an electric motor installed between the combustion engine and the transmission. 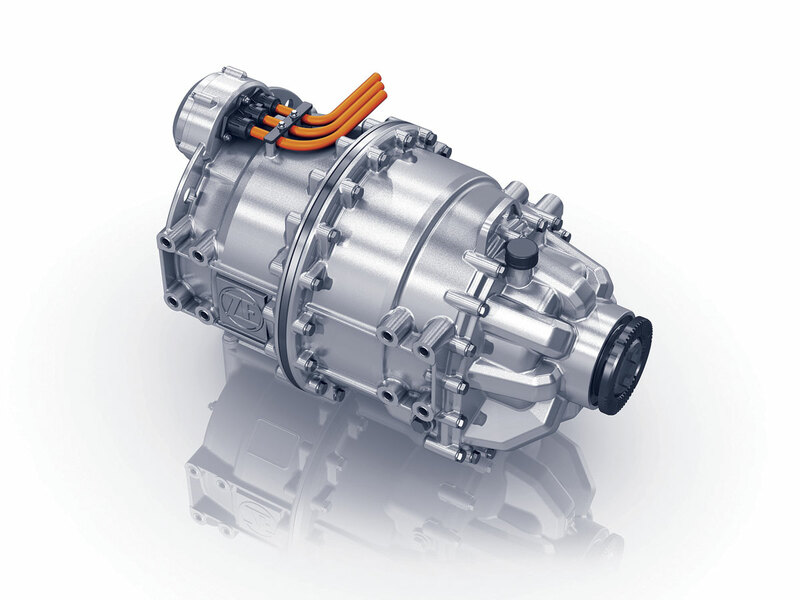 TraXon Hybrid is also suitable for coaches, where the hybrid drive has the same advantages. 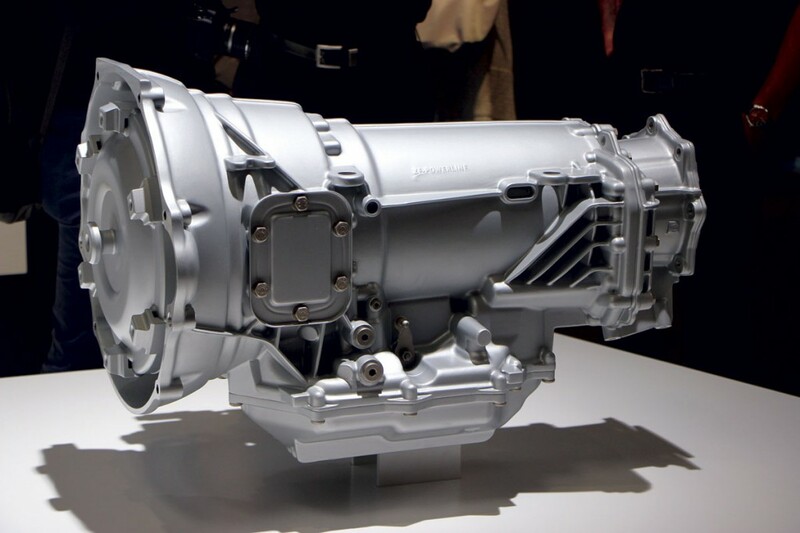 Announced in June was the PowerLine eight-speed automatic transmission for a variety of applications including buses that don’t require the EcoLife. It displayed an Evasive Maneuver Assist (EMA) system, developed by ZF in a joint project with WABCO, as well as a Highway Driving Assist (HDA) device, designed to actively keep a heavy commercial vehicle in its lane at an appropriately safe distance from the vehicle in front. It has announced plans to construct a technology centre in Hyderabad, India. From 2020, a total of 2,500 engineers will reinforce ZF’s global engineering network with an emphasis on software development to enhance the intelligence of vehicle electronic control units. Cummins has recently announced Euro6 engine compatibility for use with Hydrotreated Vegetable Oil (HVO) renewable diesel and other EN 15940 Paraffinic fuels. The manufacturer said this represents a significant step forward to reduce the carbon footprint of Cummins powered bus and coach fleets operating in Europe. Compared with conventional fossil based diesel, HVO offers the potential to reduce greenhouse gas (GHG) emissions by 40% to 90% over the total life cycle of the fuel, dependent on the level of sustainable feedstock used in the production process. HVO renewable diesel can be used as a 100% substitute for standard EN 590 Ultra-Low Sulphur Diesel without requiring any change to the Cummins engine. After a test program running on 100% HVO renewable diesel, Cummins F3.8, B4.5, B6.7 and L9 engines have been demonstrated to the regulatory authorities as being compliant with Euro6 emissions standards. Cummins has seen a shift in industry focus from emission driven regulations to an increased focus on fuel economy. In response to this, Cummins Turbo Technologies unveiled specific turbocharger components design to help achieve up to 8% turbocharger efficiency gains and improve overall fuel economy. Cummins Fuel Systems have expanded their product range with the development of a mid-range fuel system to be launched in 2017. 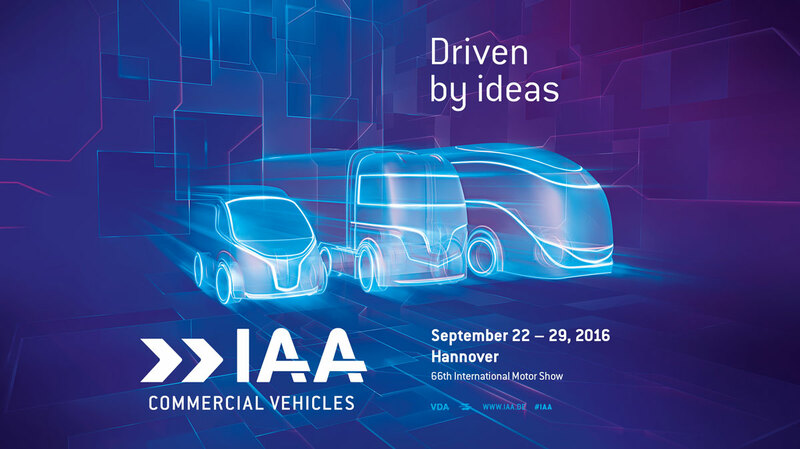 The manufacturer’s components, including fuel, after treatment and air handling systems, as well as lubricating oil and fuel filtration systems were included on a variety of vehicles across the IAA. 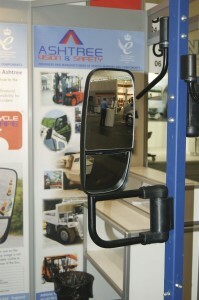 A new style of arm for wing mirrors was launched by Ashtree Vision and Safety. These have been manufactured from a new light weight material, ABS (Acrylonitrile-Butadiene-Styrene), rather than zinc as they previously were. Not only does this help reduce total vehicle weight, but makes them considerably less expensive than others. They are currently on trial and the company is looking to launch them at this year’s Euro Bus Expo. 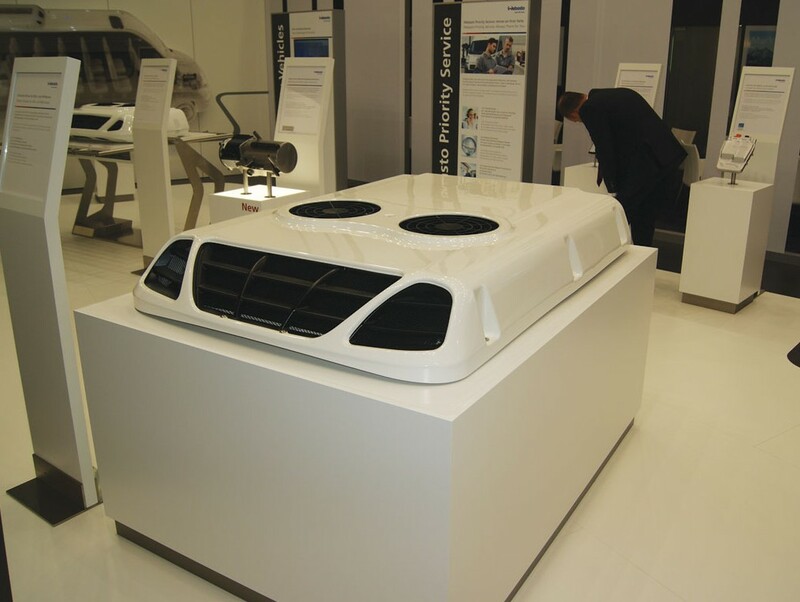 Amongst its range of door systems, Masats also exhibited to the public for the first time its new coach lift, the KV5 Lift. The product is a hydraulic vertical lift designed for high floored vehicles and is fitted behind the rear axle for maximum space efficiency. Using a double effect cylinder, it operates at the same speed regardless of whether it is laden or empty. Operated from a control panel, the system is automatic, except for the manually deployed handrails. In the event of an electricity outage, the lift can be used manually. Other products on its stand included the sliding double door 028C, its telescopic ramp RT1 for city buses, its in-swinging door 029G and manual ramp RM2 for buses, as well as an out-swinging door with DM3 module control. 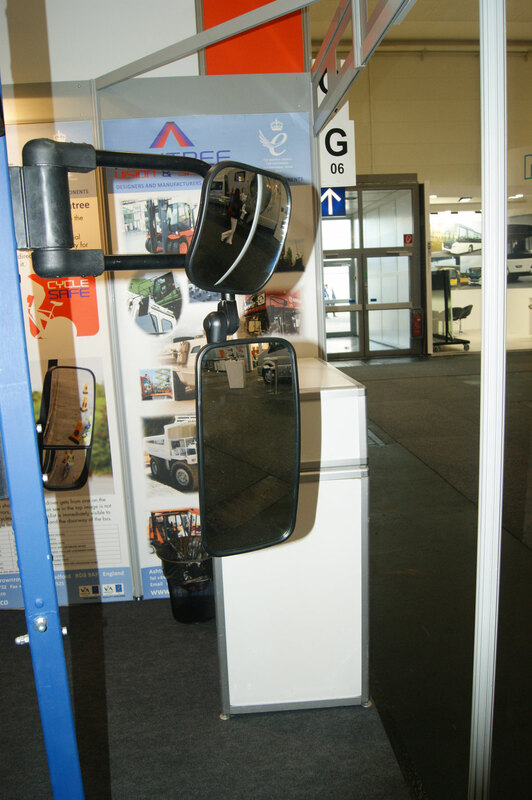 An interesting product on glass specialist, Pilkington’s stand, was a display windscreen. This consists of a windscreen with an integrated LED destination display. It is laminated and available in 216 colours. The screens are available on all vehicles and are designed to save space, eliminating the need for a bulky separate display unit, with the display being completely flush with the glass. The Thermo Top Pro 120 and Thermo Top Pro 150 are two of the newest products from Webasto. Scheduled for market launch in early 2017, the new generation of water heaters are for the high performance categories of 12kW and 15kW. The heaters are available in 12V and 24V versions and are suited for use in mini and midibuses. 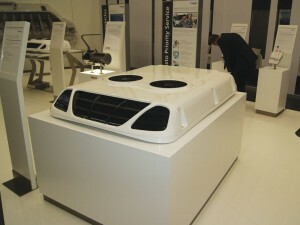 They feature a new burner concept and an intelligent diagnosis and security system. Sensors monitor the exhaust gases and coolant temperature and continuously transmit the values to the control unit. One of the new features is the automatic altitude adjustment, allowing it to ensure full heating capacity at altitudes of up to 3,500m above sea level and it can also work at temperatures as low as minus 40 degrees Celsius. With what it describes as high quality components and the brushless EC-motor, along with the higher classification of protection from water and dust, these are intended to make for an extended service life and low maintenance costs. The compact size and light weight enable easy installation of the water heater, even in confined spaces. Quantum, Q’Straint’s fully automatic rear facing wheelchair securement station for buses, was one of the main focuses of the securement system manufacturer’s stand. Having been fitted to an East Yorkshire Motor Services Wrightbus Gemini and a Lothian Buses Volvo Wrightbus Hybrid, the company claims it is in discussions with major European bus manufacturers and operators about the product. 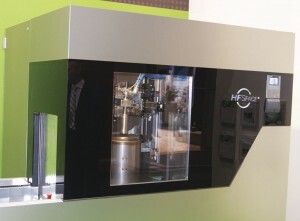 It also showcased its InQline, an integrated winch and retractor system. It has the ability to steer a wheelchair as it boards the vehicle, with an automatic tensioning function. Displayed for the first time to the public was the new QLD split lift from Autoadapt. A new cassette lift was also displayed, the first of which Autoadapt brand BraunAbility has produced. It is designed specifically for the European market. This has been created to be lightweight and has a lifting capacity of 350kg. The first production version of it was displayed at the show. New from Unwin, another brand associated with Autoadapt, is a redesigned hook for wheelchair winches. This has been engineered with an extra bump on the hook intended to keep it in position when working. The Unwin range is due to receive an update next year. 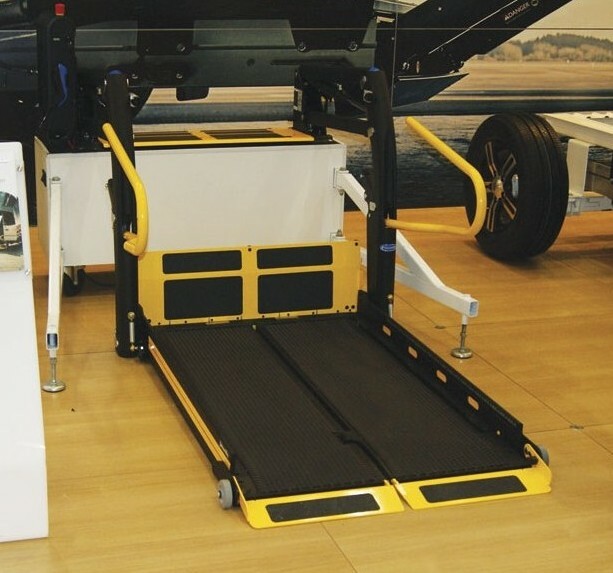 Autoadapt also had an inboard ramp on its stand, a product that proves more popular in the UK rather than the rest of Europe. Launching its HFSpace diesel particulate filter (DPF) cleaning system was Hirtenberger Filter Services. Providing a fully automated cleaning function, it includes the capabilities of compressed air regeneration, functional testing and cold and hot cleaning. According to representatives on the stand, the system takes around 60 minutes to clean a DPF unit. It is designed to be easy to use, with technicians only being required to put the unit on a conveyor tray and press a button. It requires a 400V/32Amp power connection. Actia may be a name familiar to many. 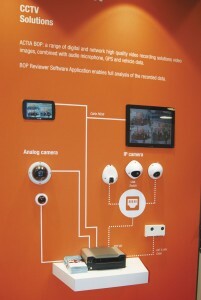 The company’s Continental cousins were at the show presenting its range of PCV CCTV solutions. These can include up to 32 cameras, long term recording with HDD capacity of up to 4TB and high resolution recording. 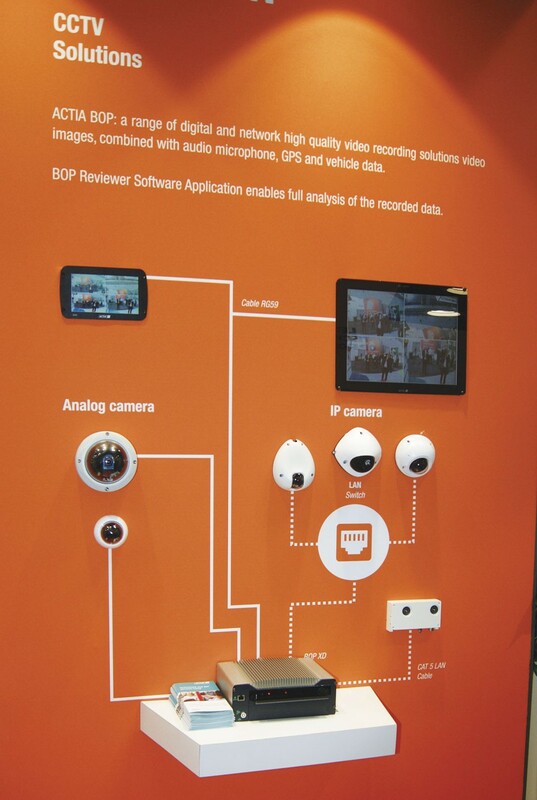 Various camera models are available with it and it can be extended at any time with additional modules, such as internal GPS and WLAN. 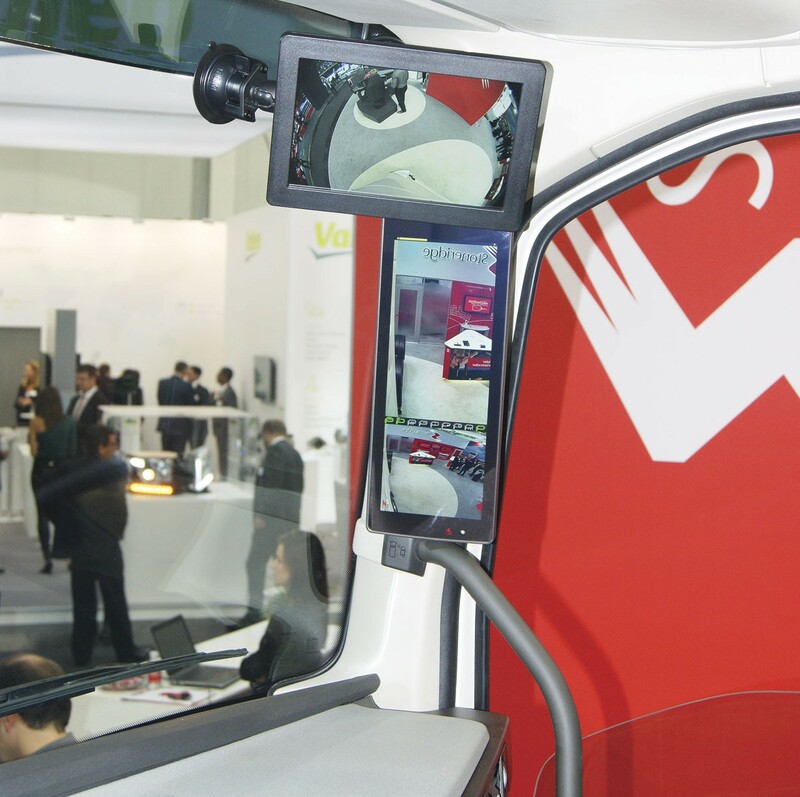 In addition, the system can be integrated with applications such as the company’s iCount passenger counting, iShow displays for passengers and SIL1 electronic rear view mirror system. In addition to the range of on board technology it provides, Actia also provided information on its Multic 2 dashboard, its third generation of generic multiplexed system for bus electrical architectures. This can be customised to suit customers’ requirements. Demonstrating its driver safety solutions was Mobileye. 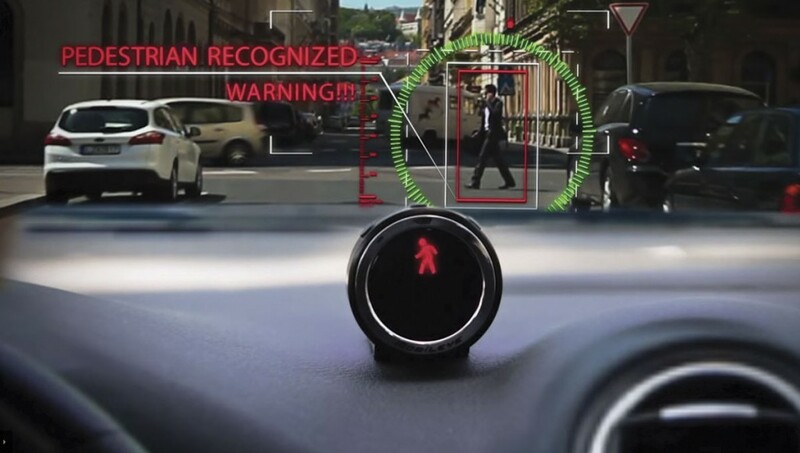 The company’s technology includes strategically placed multi-vision smart sensors, which monitor a vehicle’s blind spots and the ‘dynamic driving environment’. Its Advanced Driver Assistance Systems (ADAS) provide drivers with real time visual and audible alerts as the risk of an imminent collision increases. It provides forward and pedestrian collision warning; lane departure warnings; headway monitoring and warning; as well as speed limit indication. The company offers two different retrofit versions. Both versions can be easily installed in almost all vehicle models. In addition, Mobileye’s aftermarket products are designed to be seamlessly integrated into virtually any fleet management and telematics systems. Specifically for buses and other large commercial vehicles, it has the Mobileye Shield+ advanced collision avoidance and blind spot detection system. In addition, its Shield+ connects with any telematics system to capture and aggregate real time alert data, which helps identify hazardous road locations and infrastructure deficiencies. 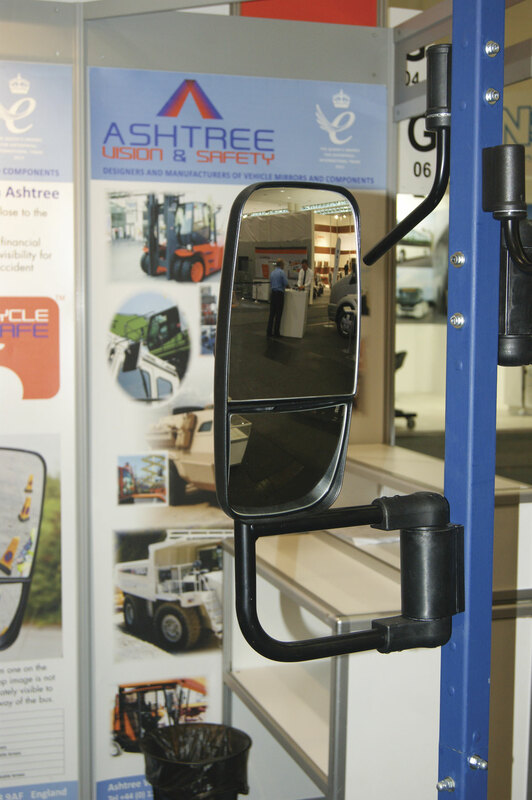 New from Stoneridge was MirrorEye, a mirror replacement system that can be used on PCVs. The system replaces mirrors with cameras and interior displays. Intended to remove the problem of blind spots, it can feature front, side and rear cameras. 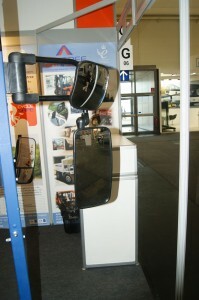 The removal of side mirrors, replaced with cameras, leads to a more streamlined vehicle, according to the company. They feature self cleaning to eliminate problems with road dirt, an advanced defrosting system, night vision and image handling capabilities to remove difficulties with direct sunlight. The latest generation of Stoneridge’s SE5000 Exakt Duo2 One Minute Rule Tachograph was on display too. It reports some operators have achieved up to 60% reductions in tachograph related infringements using this product. TomTom Telematics launched TomTom PRO 2020, a new driver terminal. The unit combines a number of features designed to enable large fleet owners using the company’s Webfleet fleet management service, to connect their entire fleets and helps them be more in control of driver style and compliance. It brings together Driver ID with buzzer alert; Logbook to capture business and private mileage; Working Times so individual employees can log time which can help comply with legislation and policy; and OptiDrive 360, which helps drivers improve driving performance with visual and audible feedback as they drive. It also provides reporting via Webfleet and the ability to integrate into existing back office systems. It will be available across Europe in Q4 2016. TomTom Telematics also announced it has teamed up with Continental Automotive. The collaboration sees them create a more efficient data archiving solution. The alliance is expected to enable users to remotely transfer data from the vehicle to the back office without having to return the vehicles to the depot or head office. It links TomTom Webfleet with TIS-Web, part of Continental’s VDO brand. The new app, Webfleet TachoShare TIS-Web Connect, will be available to customers from October 2016. One of the announcements at the show was that Wabco and Mobileye (see above) have joined forces to develop solutions for commercial vehicles that leverage advanced emergency braking ADAS functionalities and Mobileye’s REM technology that provides real-time data for precise localisation and high definition lane data. Wabco introduced its OnGuardMAX advanced emergency braking system (AEBS) too, which provides up to full braking when confronted with both stationary and moving vehicles ahead. Equipped with state-of-the-art 77GHz radar and a high resolution camera, the system detects impending rear end collisions with vehicles ahead and alerts the driver with acoustic, visual and haptic (vibrations) warnings. In addition, it provides lane departure warning (LDW) functionality. Wabco also presented its OnCity Urban Turning Assist system, designed to help protect pedestrians and cyclists in city traffic. A single sensor solution, the product is the first collision avoidance system that uses LiDAR technology for the purpose of object detection. Providing a 180 degree field of view (said to be the industry’s widest ever), it detects and distinguishes moving and stationary objects, including pedestrians and cyclists. The device visually and acoustically alerts the driver regarding a potential collision. Drivers’ seat manufacturer, Be-Ge, showed an example of its 9000 series, which has recently been given a redesign to update its appearance. For trim, the company presented Nightfall, a fabric from Camira which has achieved over 250,000 rubs on the Martindale test. The company’s Memory seat was displayed which has a number of buttons rather than levers to adjust its position. Each driver has a key, on which they have saved their own personal configurations, meaning all they have to do to adjust the seat to their requirements is to tag their key onto the control panel. Grammer displayed its Regional 3000 passenger seats at the show. 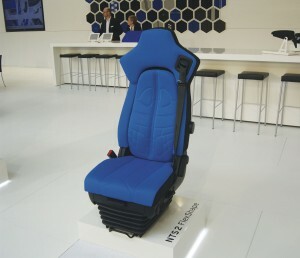 The company also promoted its Linea and Tourea driver seats, which have been designed to ensure the occupant’s posture is healthy while seated. They both have a number of adjustments to suit individual drivers. 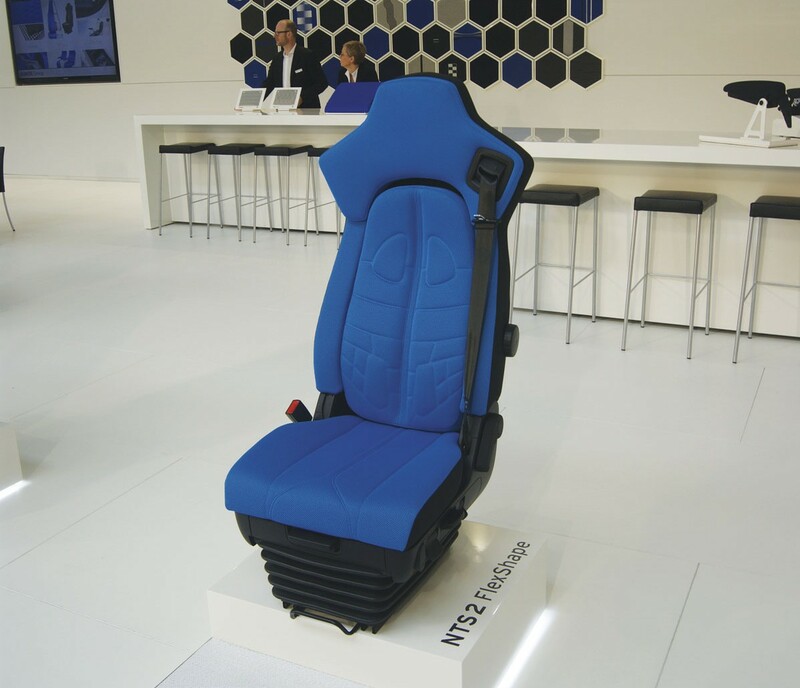 On display at Isringhausen’s stand was an example of the new coverings it has available for its NTS 2 and NTS 2 Slim seats. There was also the company’s FlexShape model on display, which is designed to align to the spine, adjusting to fit the body. Another product on its stand was the Pathfinder, a driver’s seat that can be swivelled and turned into position. However, the driving position is locked to ensure safety. ‘Total Tyre Care – Identifying with your fleet’ was the theme at Bridgestone’s booth, demonstrating how it can apply what it describes as its Total Tyre Care to serve the specific needs of each fleet. There was particular focus on its Tirematics system, which continuously delivers live data on the condition of the fleet’s tyres. This is an IT system that uses sensors to measure air pressure and temperatures of bus tyres. It uses a cellular network to remotely monitor and transmit real time information about the tyres, as well as vehicle location. When abnormal air pressures or temperatures are detected, it can be set up to inform the engineering manager (or the relevant member of staff) and the driver. Continental launched a tyre information and management system for commercial fleets. The new offer, called ‘ContiConnect’ monitors, analyses and reports tyre pressure and temperature for the entire fleet based on data collected by the proven ContiPressureCheck sensors. ContiConnect notifies the fleet manager and offers corrective measures if needed, for instance through a Conti360° service partner. An online portal provides transparent reports on the fleet’s tyre performance and overall efficiency. It will be launched into the industry during the second quarter of 2017. In addition to this, the company had on display examples of its range of coach and bus tyres, as well as a demonstration of its ContiPressureCheck. As well as a range of new commercial vehicle tyres, Michelin was promoting its Michelin Solutions package. The service is customised to customer requirements and is intended to add value to their operations, providing fleet management tailored to each client’s specific needs, for better safety, profitability and quality of services. Over 300,000 vehicles across Europe benefit from these mobility solutions related to the outsourced management of fleet tyres through the company’s Effitires offering. News from Hankook at the show was the announcement that they are to be the OE supplier for various Scania heavy goods trucks and buses produced in Europe in the future. From November 2016, Hankook will supply tyres to the production locations of the commercial vehicle manufacturer in Sweden. Tyres to be used include the e-cube MAX line for international long-haul traffic, a series which has been optimised for rolling resistance, and the new SmartFlex all year tyre range, designed for flexible use between long-haul and delivery traffic. Construction site and off road treads from the SmartWork series will also be introduced. 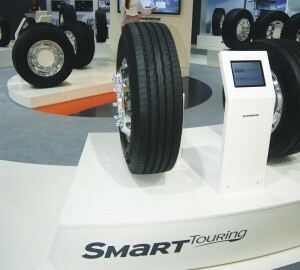 Hankook also presented a tyre for long distance European coach travel. The Hankook SmartTouring AL22 will be available in the sizes 295/80R22.5 and 315/80R22.5 from market launch and is suitable for all long distance coach wheels in all axle positions. The carcass contour of the tyre is designed to ensure the best suspension properties and should contribute to a particularly safe driving style. It features special Multi-3D sipes for both good traction and an outstanding braking response. The individual belt layers are arranged in such a way to reduce heat when in operation. This not only reduces rolling resistance, but also extends the service life of the tyre.